so...i've found a new obsession! tights tights tights, perfect all year round to be dressed up or down(; being that i've been wearing tights since i was 2 because of ballet, i just couldn't imagine myself wearing them on a normal basis with street clothes rather than...those not so flattering leotards, iick! i don't know about you lovies but i'm soo excited for thanksgiving i can hardly wait...but it's not so much for the turkey and biscuits...but rather the after thanksgiving high...meaning, christmas decorations and lights go up, christmas music is played 24/7, sparkly red nails are a must and late night christmas light drives...eeeee it's just so marvelous, yes? but i must not forget to share how thankful i am for all of you readers, my family, friends, and phillip<3 without all of you beauties my life would be incomplete! hehe that's enough about me, have you taken the time to think about what you're thankful for? 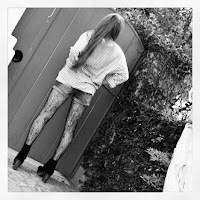 uhhh Loving this look so so much....tights are awesome & you rock them! so many pretty pictures!! I love the tights on you!! so fab! 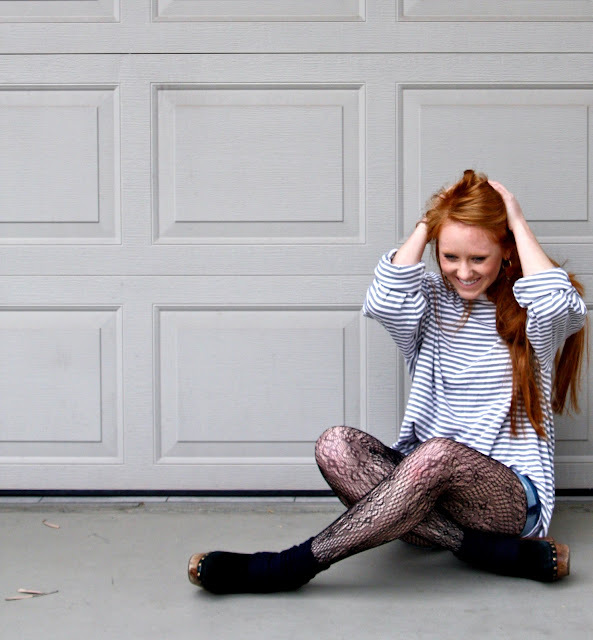 Those patterned tights are awesome! Um... probably a thousandddd people have told you this, so I'm just going to say it again.. Your hair is BEAUTIFUL! Is that natural? 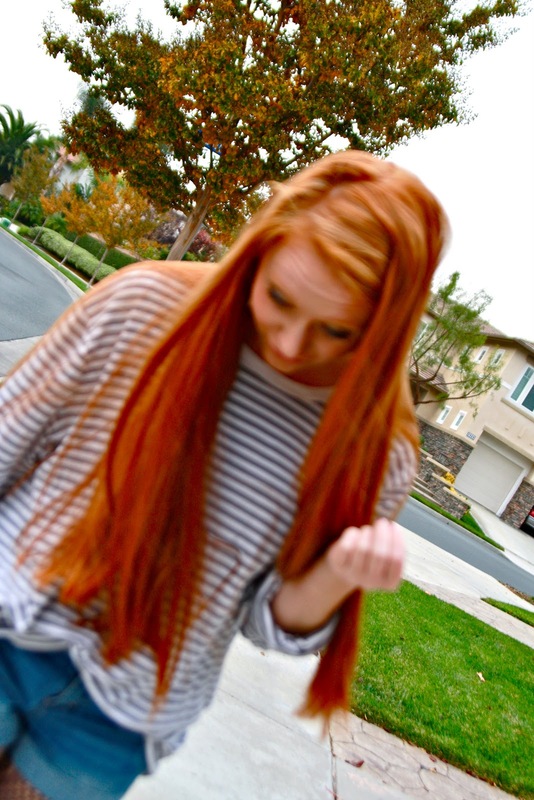 I dyed my hair red once.. no... no NOT good for me! I looked like I was a tomatoe :( not cool. your hair looks uuuunreal in these, it's just a lovely color! 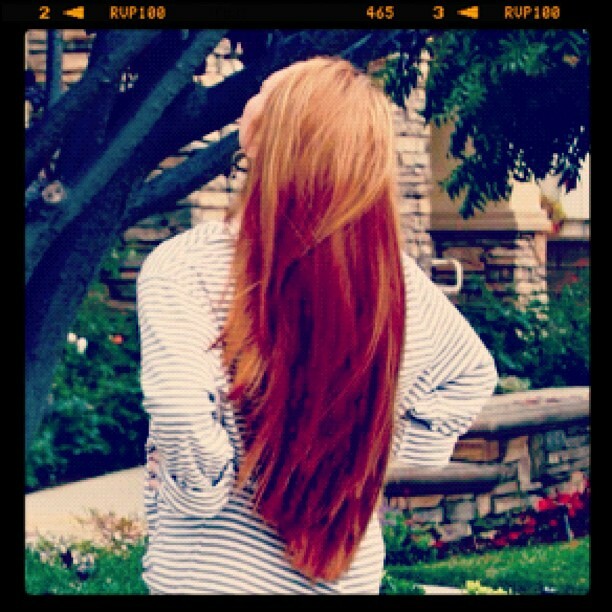 Oh my gosh, your long hair is SO beautiful!!! your shoes are just wow!!! Love them! 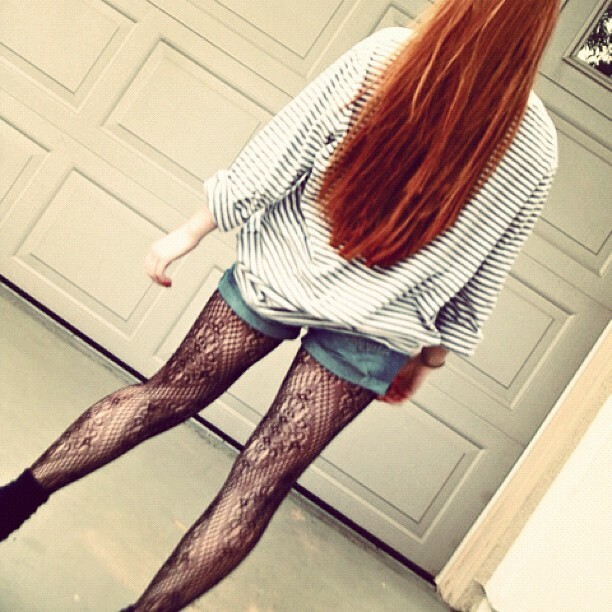 your hair <3 wow love the tights! Love your outfit!So beautiful hair! You look fab, hun. :) I wish we could wear tights here in Hawaii, but it doesn't get chilly enough. It's not Thanksgiving where I live but I love the Holiday season SO much! Have a happy happy one dear! Great look. I love your hair. Lovely hair. The outfit was nice. Please don't forget to LIFO. It is a fun site for girls that has a virtual closet feature which allows you to upload your own personal closet and create outfits you can share with friends. 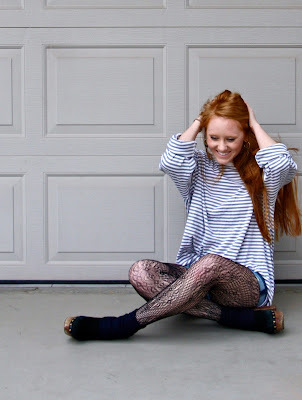 You look fabulous- love the stripes, love the tights! Striped blouse, shorts, socks and ankle boot, great! I absolutely love the first picture. It's so girly, so naive (in a good way). 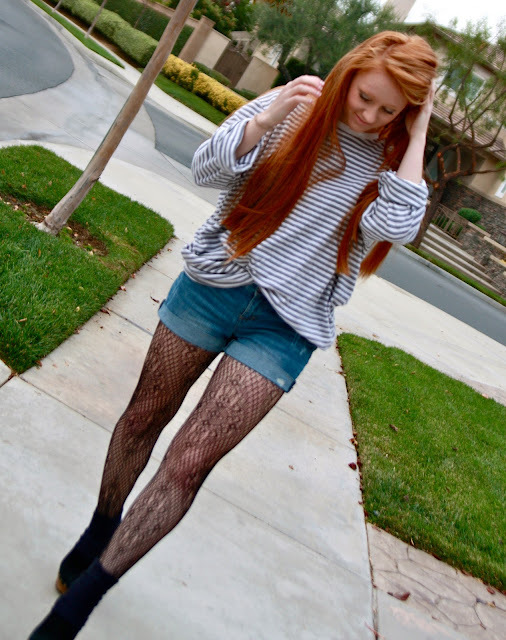 Love the lace tights, they just pull the outfit perfectly together. Hope you had a perfect Thanksgiving. i love your tights and shoes combo, incred! Oh my gosh! You look gorgeous in this outfit. I have to admit, I've been wearing tights a lot lately lol. Wolford has some pretty amazing prints/designs of tights. You should check them out because you'd probably want them all...like I do lol. 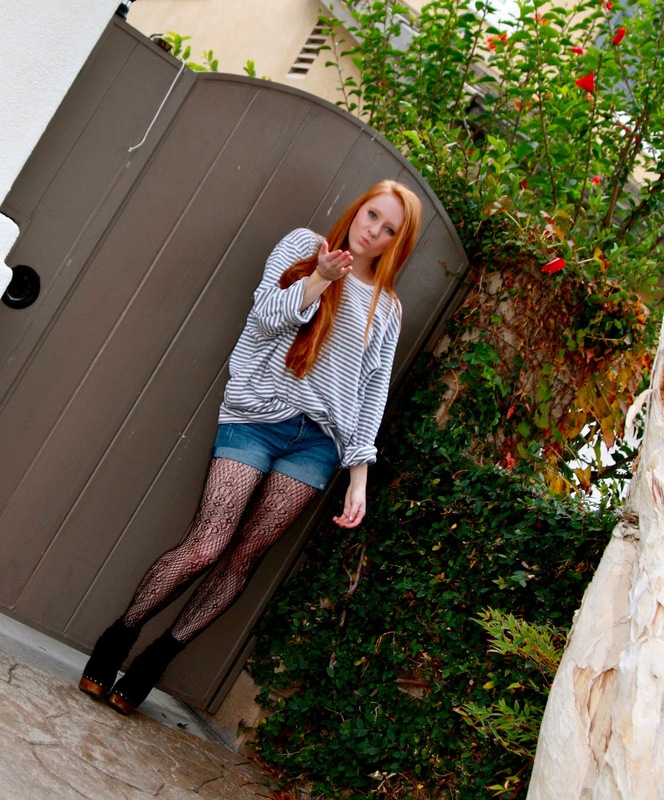 I love your tights and your shoes so much!! i obsessed over them last fall! they are wonderful! haven't worn any yet this year! The tights make it sooo rocknroll!! Your hair makes me hate my own. So pretty!